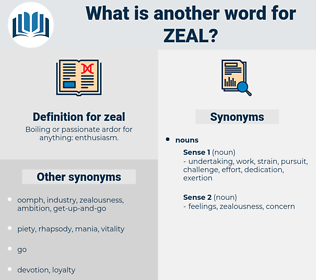 What is another word for zeal? 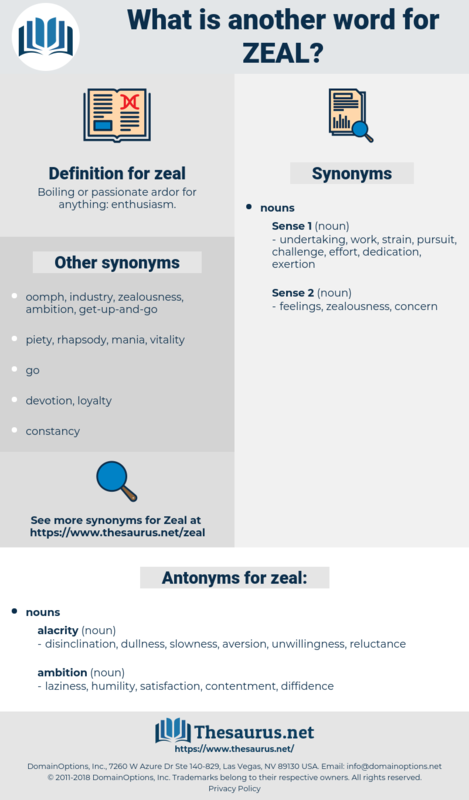 Boiling or passionate ardor for anything: enthusiasm. fervour, vigour, haste, devotion, ambition, desire. diligence, dedication, alacrity, zest, commitment, excitement, craze, willingness, keenness, determination. disinclination, dullness, slowness, aversion, unwillingness, reluctance. laziness, humility, satisfaction, contentment, diffidence. repulsion, revulsion, loathing, hatred, antipathy, dislike, disgust, distaste. fluctuation, change, irregularity, unsteadiness, inconstancy, instability, changeableness. deadness, caution, calculation, policy, dulness, timidity, wariness, lukewarmness, prudence. And all this is done with a sort of unconsciousness, very gradually, and as the effect of a zeal that was supposed to be Christian. Stirr'd by an overwhelming zeal, And social impulse, a terrible throng! fervency, ardor, fervour, fire, fervidness, fervor, ardour.